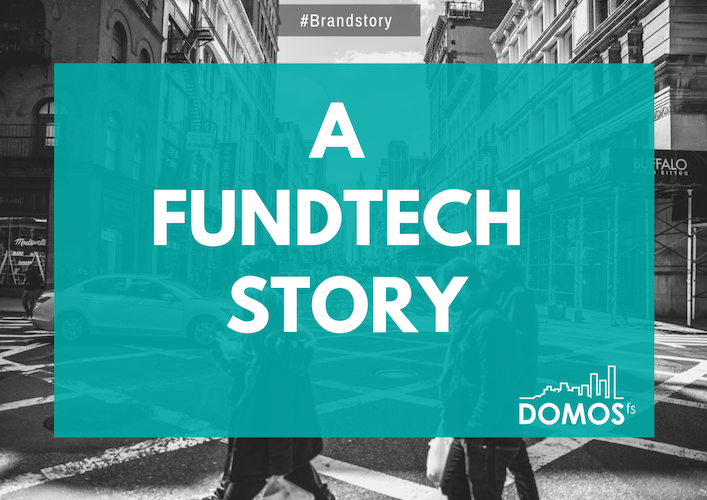 Who’s behind the success of Domos FS – the French startup that is rising on the European FundTech scene? Find out how a team of tech-savvy and financial experts turns data into a strategic analytical tool for Alternative Investment Funds managers. Domos FS was founded by normalien, serial entrepreneur and tech savvy, Arnaud Vinciguerra. Before creating his FundTech, Arnaud had quite a few miles on the clocks. In 1985, he founded Sophis with his brother. Soon after, the company became one of the French software leaders by revolutionising the market of front to back solutions for traders. About twenty-five years later, the company was bought out by Misys, which later became Finastra – the world’s third-largest financial technology (FinTech) company. In the aftermath of the global financial crisis, the risk management function independent from the manager emerged. With this context in mind, Arnaud decided to come to market with a technology-first approach. In 2013, Domos FS emerged as a FundTech dedicated to Alternative Investment Funds. 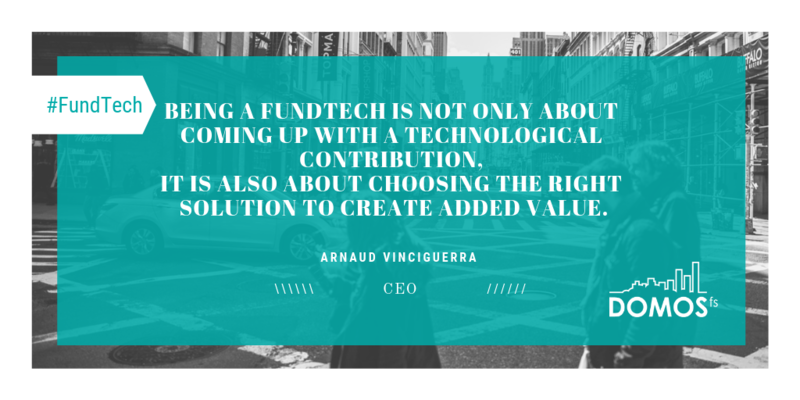 Being a FundTech is not only about coming up with a technological contribution, it is also about choosing the right solution to create added value. On top of being tech savvy, Arnaud has been a Private Equity investor for a decade. From this experience, he was able to see an opportunity to bridge the gap between Alternative Investments, including Private Equity, and Technology. To build up his team, Arnaud tapped into his first company to find specialists. The first expert to join his team was Philippe Jovenin, a Polytechnician. In Domos FS, he leads a team of web developers. In 2014, Benoît Moulin joined the FundTech as a Sales Manager. Having advised Alternative Funds Services provider in a professional services company in Luxembourg, he has a good grasp of what Private Equity and Real Estate players need in terms of technology and the challenges involved by new regulations (eg. AIFMD). With Domos FS, he is taking over business development from Luxembourg with the objective of expanding the company to other European financial markets. Then came Fanny Metz Teissedre, who kicked off her career with Arnaud. From him, she has learnt to identify a market gap and turn it into an IT solution. As a Client Services Manager, she supervises a team in charge of regulatory monitoring, software implementation and its follow-up as well as support and maintenance. The team now includes about ten IT engineers and financial experts. The RegTech continues its development by intensifying its recruitment efforts in 2019. Private Equity, Real Estate, Infrastructure, Debt… Alternative funds include a myriad of investment strategies. Thanks to their performance uncorrelated to global variations in financial markets, this type of funds has quickly become a mainstay of management companies, commonly known as ManCos. Yet, regulations and guidelines to restore health to markets and protect investors multiplied. Case in point: AIFMD and MifiD 2, to name but a few, created many organisational challenges for managers. This context provided the backdrop for the Software-as-a-Service pure play company to market its self-titled web solution. Indeed, DOMOS automates the back and middle-office needs of funds. The solution is aimed at Alternative Funds investing in non-listed funds, including Private Equity, Real Estate, Infrastructure and Debt. As such, this model is fundamentally different from the one used for listed assets, which are already dematerialised. Based on a workflow technology, the complete solution allows managers to deal with Alternative Assets tailored to their individual needs. 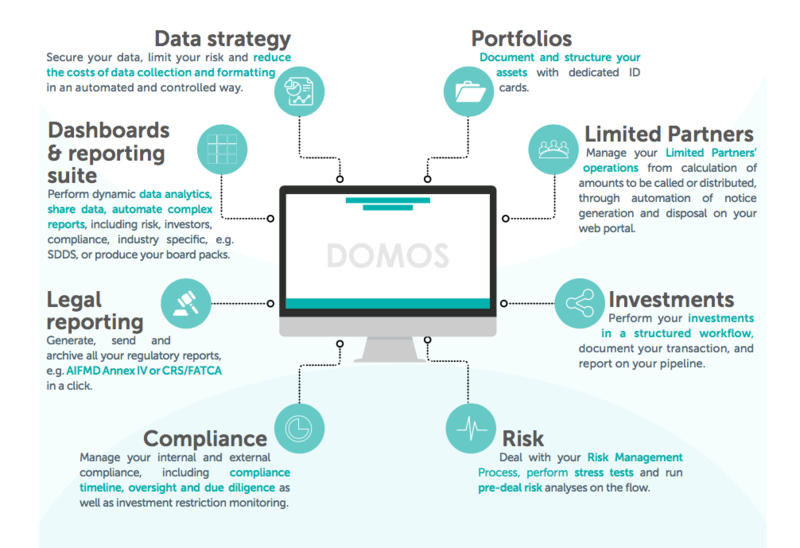 All in all, DOMOS is a modular solution that covers the entire portfolio management value chain, from transaction management to risk management, compliance, reporting and data analysis. For instance, the solution leverages the regulatory reporting requirement, in particular collecting, compiling and publishing data. By using and making this data available to other audiences than regulators, DOMOS creates additional added value. With its intuitive design and UX navigation, DOMOS is simple, yet strategic. 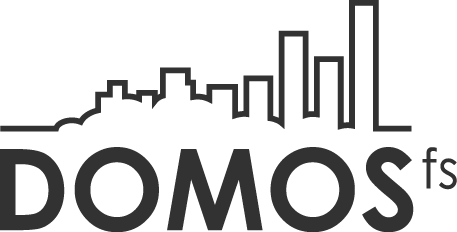 Have a look at the different modules of Domos.